The Arctic region is attracting an increasing amount of attention from the global community. In large part, this is due to the fixing of international external borders to the continental shelf, the transit opportunities afforded by the Northern and Southern Sea Routes, and the promising prospects for exploitation of the Arctic’s natural resources. On Oct. 25, as part of an ongoing Command Post Exercise (CPX) in the Western Military District, the coastal forces of the Northern Fleet made Russia’s first ever sea-borne landing on the shores of the uninhabited Kotelny Island. This is the first time that combat training of this kind has focused on protecting civilian facilities – research stations, drilling facilities and energy-industry installations located in the Arctic region. These are the reasons the large destroyer “Vice-Admiral Kulakov” and the heavy nuclear-powered battle cruiser “Pyotr Veliky” were stationed in coastal Arctic waters of the Northern Sea Route. More than 7,000 military personnel and 150 objects of military equipment have been involved in the CPX. 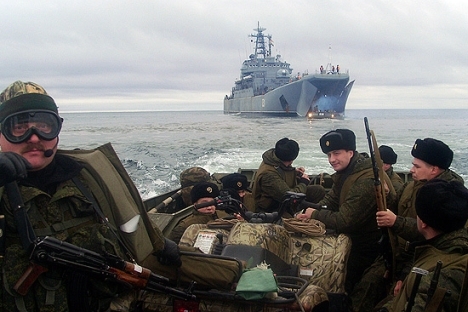 Training exercises will be conducted in the military testing zones of the Barents Sea, the sub-Arctic areas of the Northern Sea Route, the coastal regions of the Pechenga Area in Murmansk Region, and on the Sredny and Rybachy Peninsulas. Russia is not the first country to announce the deployment of military bases in the Arctic. In early 2012, Canada announced that it was setting up an Arctic base on Cornwallis Island. Denmark, too, is making preparations to expand its military presence in the Arctic Ocean. As early as 2009, Denmark mentioned that it was setting up a special Arctic Military Command with a rapid reaction force. A year later, Norway stepped up to requests from its own Polar Command officers, and the U.S. and Canada began conducting regular military exercises in the Arctic. This level of military activity is understandable. Competition for influence in the Arctic has increased considerably, especially since climate warming began in the area. It is estimated that nearly one quarter of the world’s untapped hydrocarbon resources is located in the Arctic. “In addition, a route via the Arctic is not only the shortest for shipping, but also for strategic aviation and intercontinental ballistic missiles,” Sivkov said. The Northern Sea Route is the shortest sea route between European Russia and the Far East. The alternative to this route would be a transport course via the Suez or Panama Canals. However, if the distance by ship from the Port of Murmansk to Yokohama (Japan) via the Suez Canal is 12,480 nautical miles, then the same trip via the Northern Sea Route is only 5,770 nautical miles. The principle obstacle for sea-going vessels on the Northern Sea Route is the ice, but contemporary ice-breakers are capable of ensuring year-round navigation. It is clear that the Navy will take principle responsibility for defending Russia’s installations in the Arctic. Russian defense spending for the period through 2020 includes new vessels for the Northern Fleet. “We need ships that are capable of serving long term in the Arctic zone,” said Rear Adm. Vassily Lyashok, chief of planning for the Navy Development Section, as well as deputy chief of general staff for the Russian Navy. “They need to be nuclear-powered and equipped with ice-breaking capabilities. Moreover, media sources report that Russia will place a squadron of Mig-31 long-range fighter interceptors on the Novaya Zemlya archipelago in the Arctic, in order to safeguard its territory against possible threats from the North. Russia has also stepped up efforts to strengthen its Polar border infrastructure. Secretary Nikolai Patrushev of the Russian Security Council said in August that the Northern Sea Route would be strengthened by the creation of military naval bases and border services. By 2021, according to Igor Palutsa, head of the FSB’s Coastguard Department, 11 new border centers will be set up. A number of seaports and dual-purpose airfields are also planned.